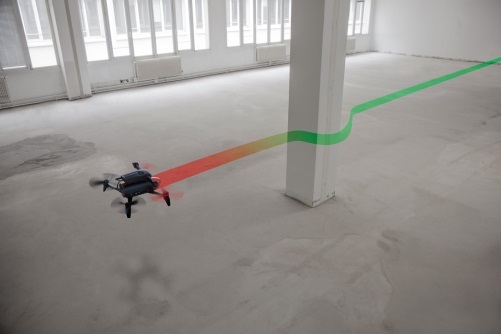 Parrot, the French company that is probably best known for its AR.Drone and Bebop drones, today announced the Parrot S.L.A.M.dunk, a new development kit for helping drones and robots navigate indoors, avoid obstacles and map its surroundings. The S.L.A.M.dunk (I know I’ll never tire of typing that out), which the company announced at the annual Interdrone conference in Las Vegas today, will be available in the last quarter of the year. The company has not announced pricing yet. The 4.9oz kit uses an Nvidia Tegra K1 processor and runs Ubuntu 14.04 with the Robotic Operating System framework on top. It uses two fisheye cameras for stereoscopic imaging at 60 frames per second, as well as an ultrasound sensor, an inertial measurement unit, a barometer and a magnetometer. The kit also features USB and HDMI plugs. Parrot says the ultrasound sensor should be able to pick up objects that are up to 50 feet away. Parrot expects that developers, researchers and integrators will use the S.L.A.M.dunk to prototype drones and robotic solutions and use it for autonomous navigation and 3D mapping products. While Parrot itself is best known for its drones, the kit is also meant to work for rolling robots and even articulated arms. “Developed by robotic researchers for robotic researchers, Parrot S.L.A.M.dunk is a ‘ready-to-use’ module that will accelerate the development of tomorrow’s application for drones and robotic platforms,” the company says in its announcement today. This announcement may feel unusual for a company that is mostly known for its consumer drones, but Parrot actually offers a number of professional drones under its SenseFly brand and the company has long invited tinkerers to write applications for its drones with the help of its SDKs. Today’s announcement takes this one step further. It also signals the company’s intentions to bring its expertise to a wider range of robotics products, too. And who knows, maybe the Parrot T-shirt will even feature an ultrasound sensor and help you avoid objects as you drunkenly stumble home at night.